(BOSTON and HOPKINTON, Massachusetts) — The Wyss Institute for Biologically Inspired Engineering at Harvard University and the KeepSmilin4Abbie Foundation announced today their partnership to advance research and development efforts in the early detection and treatment of anaphylaxis, a severe allergic reaction triggered by exposure to certain foods, materials, medications, and insect bites. According to the Asthma & Allergy Foundation of America, over 15 million Americans are at risk of anaphylaxis, and every three minutes a food reaction sends someone to the emergency department. 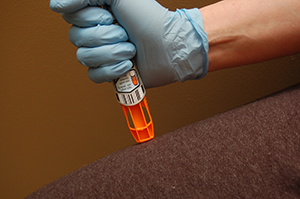 In most individuals, the anaphylactic escalation that leads to shock can be prevented by administering the counteracting drug epinephrine. Yet, despite effective treatments, anaphylaxis fatalities are still common and prevention remains difficult to achieve. Due to the rapid and unrelenting progression of symptoms, tragedy strikes when life-saving epinephrine cannot be injected into anaphylaxis-stricken individuals immediately following initiation of an attack. The tragic death of Abbie Benford illustrated this disastrous outcome. Due to the fast progression of her attack, epinephrine was not administered quickly enough. Abbie died in intensive care in 2013 shortly before her 16th birthday. The tragic loss of Abbie compelled her family to establish The KeepSmilin4Abbie Foundation in 2014, with the mission to fund research into technology for the early detection and treatment of anaphylaxis and to increase awareness of this life-threatening complication. The partnership aims to develop a deep understanding of the processes heralding an oncoming anaphylactic episode at the earliest stages. “Our goal is to develop a reliable device that detects these very first changes by continually monitoring critical physiological and biochemical signals. Once a critical threshold is reached, the device would alert caregivers and auto-inject a life-saving dose of epinephrine,” said John Osborne, Wyss Institute Senior Engineer, who is the program’s technical lead. This effort is led by Dr. Benjamin Matthews, M.D. Assistant Professor of Pediatrics at the Harvard Medical School and the Division of Medicine Critical Care at Boston Children’s Hospital, working with a highly interdisciplinary group of engineers and scientists in the Institute’s Anticipatory Medical & Cellular Devices and Biomimetic Microsystems platforms. “I feel honored to be working with Stephen and Amy Benford on this project with such a tremendous group of engineers and support staff here at the Wyss Institute. This groups’ vision and dedication to this project will no doubt lead to a device that would have saved Abbie’s life, a technology the Benfords envision as their gift to those with severe allergies who live in fear of anaphylaxis,” said Matthews. The anaphylaxis intervention program at the Wyss Institute was launched at a ceremony on September 2, 2015, during which the KeepSmilin4Abbie co-founders, Stephen and Amy Benford, presented their first gift contribution to the Institute team. “At-risk teenagers like Abbie are most likely to be stricken by sudden death from anaphylaxis. Most medical problems can be solved with early detection. For anaphylaxis this is a subjective assessment by the patient that can cause delays in treatment. We believe technology-enabled early detection and treatment will remove ambiguity in the assessment phase, providing patients with early notification and treatment that saves lives. And we think the Wyss Institute team uniquely combines the science, technology and clinical realms to solve this problem” said Stephen Benford, Abbie’s father and Executive Director of The KeepSmilin4Abbie Foundation. The Wyss Institute and KeepSmilin4Abbie Foundation are working together to create a wearable device that can stop anaphylaxis and save the lives of at-risk children and adults who suffer from severe allergies. “All of the members of our team at the Wyss Institute were touched by the Benford’s compelling story and their passion for making a difference. Given the strength and breadth of our multidisciplinary team, and our close alliance with our clinical partners at the Boston Children’s Hospital, we are uniquely positioned to help them solve this problem so that no child needs to fear this problem in the future”, said Wyss Institute Founding Director and co-leader of this effort, Donald Ingber, M.D., Ph.D., who also is the Judah Folkman Professor of Vascular Biology at Harvard Medical School and Boston Children’s Hospital, and Professor of Bioengineering at SEAS. The KeepSmilin4Abbie Foundation (http://KeepSmilin4Abbie.org) funds research into technology-enabled early detection of anaphylaxis, raises awareness of the severity of anaphylaxis and funds scholarships for students in their community. The Foundation was formed by the family of Abbie Benford, who died from anaphylaxis in December 2013 just eight days before her sixteenth birthday. The Foundation has raised over $150,000 since inception, and has awarded grants to Boston Children’s Hospital, four scholarships to students in Abbie’s hometown of Hopkinton, Massachusetts, and recently awarded a $25,021 gift to the Wyss Institute to fund research into an anaphylactic detection and therapeutic device. The KeepSmilin4Abbie Foundation is a 501(c)(3) under the United States Internal Revenue Code.